The biscuits of Mongolia project is an endeavor of L&TM5K Ambassador to the Post-Soviet Fringe Meaghan. It is republished here by permission, although I haven't yet held up my own half of that agreement. I better get on that. The biscuits of Mongolia project, #1. Packaging languages: Russian, Ukrainian, English (GB), and Kazakh. Mouthfeel: dust and ashes, slightly gritty. The proper beverage is also indicated by its name. The Russian word чай means 'tea'. 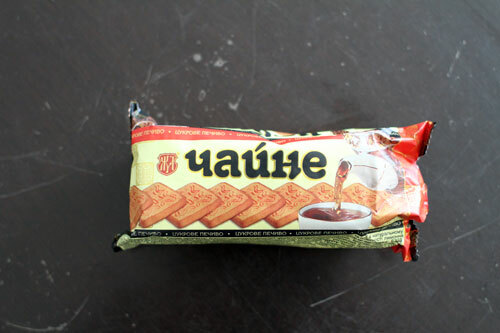 The other two letters make the sound 'na' or 'neh' so the name of this biscuit is pronounced "china'! Nifty, eh? Under no circumstances should you ingest these items. They are composed of radioactive dust and ashes from incinerated buildings. I am eating the cereal made from same each morning, and although I am losing weight in an admirable fashion, I am also grinding my teeth down thanks to the grit. Plus I glow in the dark.